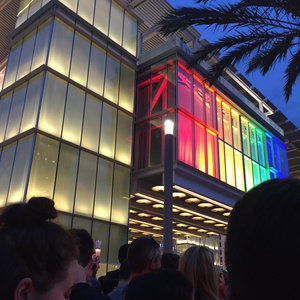 The Dr. Phillips Center for the Performing Arts became more than a cultural hub Monday night — it turned into place of healing for 2,700 Central Floridians. A legion of musical talent headlined in “From Broadway With Love: A Benefit Concert for Orlando” to honor the 49 victims of the Pulse massacre and raise funds for the LGBTQ+ community. Net proceeds were equally divided and donated to the Hope and Help Center of Central Florida, Zebra Coalition and the GLBT Community Center of Central Florida. In addition to the Orlando Philharmonic Orchestra and the Orlando Voices United Choir, the sold-out performance featured Broadway and Orlando icons, including Tony-award winner Kelli O’Hara, SirusXM radio host Seth Rudetsky, Glee sensation Darren Criss and UCF alumnus Justin Sargent. Both Rivera and Callaway were part of the ensemble of Broadway performers who added their collective voices to the outcry against the Pulse rampage last month. Along with more than 60 other renowned artists, including Idina Menzel and Lin-Manuel Miranda, the two women recorded a special version of Burt Bacharach’s “What the World Needs Now Is Love” to benefit the GLBT Community Center of Central Florida. The session was orchestrated by Rudetsky and his husband James Wesley, who produced the song, just days after a heavily-armed gunman opened fire at Pulse nightclub. To clear his mind after the shooting, Wesley biked through the streets of downtown New York while listening to “What the World Needs Now Is Love” on repeat. Its heartfelt lyrics inspired him to honor the 49 victims in the way he knew best — through music. Wesley and Rudetsky welcomed the performers onstage to sing “What the World Needs Now Is Love,” signaling the finale of the three-hour benefit concert. Audience members raised their arms in the air and made heart shapes with their hands. Others placed their arms around each other and swayed to the beat of the music.